Let’s face it, not all of us have been blessed with neighbors we enjoy seeing every day. If this is your situation, planting privacy trees is the perfect solution! 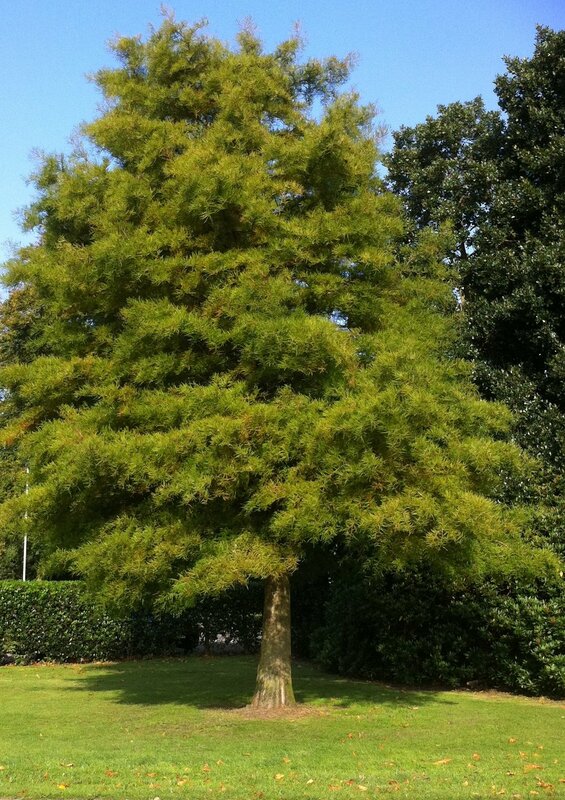 We have come up with a list of the best and fastest growing trees to plant in your lawn in Georgia for maximum privacy! This is the go to species when planting for privacy but not having the patience to wait years and years for a few inches. They are very symmetrical and professional in shape and growth habit, giving your landscape a manicured professional look. Amazingly, they grown at at rate of 3-5 feet per year, reaching a total height of 40-60 feet tall. They can adapt very well to any type of soil or condition so no need for a soil test. 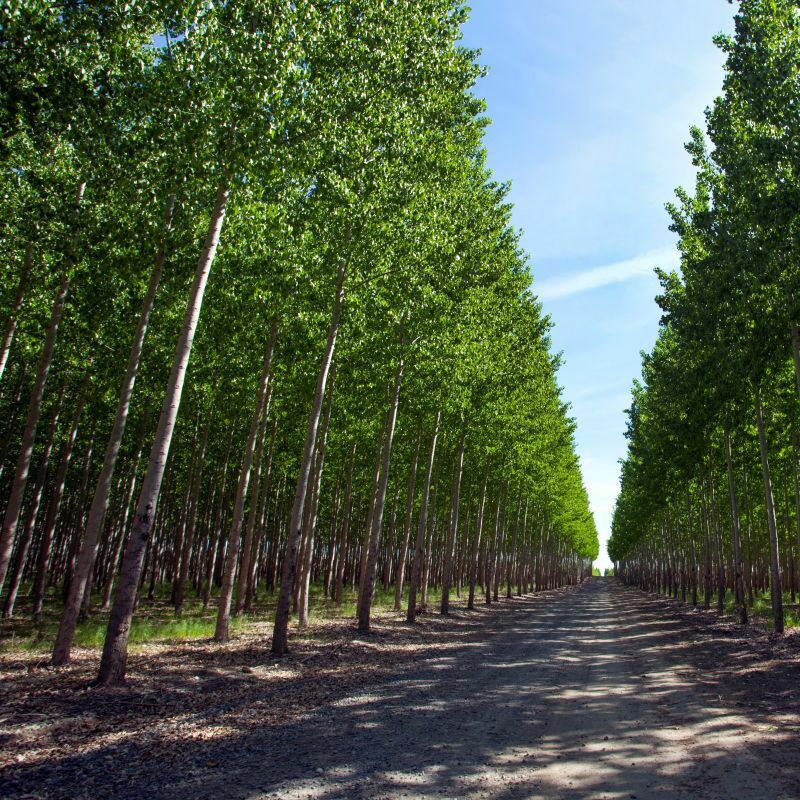 The hybrid poplar is second on the list, as their branches do not fill out to be as dense as the Leylands but their growth rate is about 5 -8 feet per year. Reaching heights of 40-50 feet, this isn’t a species you want to put close to power lines. However, they can be harvested for firewood after about 6 years. They prefer wet soils and full sun, so prior to planting make sure you can provide for the nutritional needs of this monster! You may have spotted this species in busy apartment complexes or outside of restaurants nearby. Known for its uniform appearance, the Aborvitae grows at a fast rate of over 3 feet per year. Growing to a mature height of around 50-60 feet tall, this dense tree will provide more than enough privacy for your property. Redwood species are typically home to all areas of the west coast. However this species can survive in zones 5-8 with a semi- fast growth rate of over 2 feet per year. This beauty should be planted in the fall to allow time for the roots to establish before the cold sets in. Redwoods prefer full sun, wet soil and well drained soil. Last but certainly not least, the Japanese Cedar is a rapid grower of about 3-5 feet per year with a mature height of 30-40 feet tall. This trees branches are very densley packed, like the leylands, providing a substantial amount of privacy per tree. They prefer full sun to part shade and are very drought tolerant for those of us who aren’t good with high maintenance trees. If you need help picking out a privacy tree in Monroe, Ga. our team of certified Arborists would love to assist you! Call or come by our office today for more information! Spring has sprung and we’ve all been affected by the dreaded pollen this year. However, the trees and plants are blooming providing our landscapes with something to be proud of this spring! The eastern Redbud is one of the most commonly chosen trees for residential and commercial properties in Stone Mountain, Ga. and there are many reasons why! They are very fast growers and usually start to blossom within 4 years of being planted. Smaller landscapes hold them well, as they are naturally small growers, usually only up to 20 foot high with a similar spread. Their flowers are bright purple/pink and provide wonderful color in spring and in fall. Their blooms attracts a variety of wildlife including butterflies and songbirds. They carry a very distinct heart-shaped leaf, very small in size. It has a great adaptability in different zones and can sometimes thrive very well in other areas. The Cercis canadensis (Eastern Red bud) is native to North America and was used as a healing tree to many Native American tribes. The bark on the Red bud was believed to treat whooping cough, many fevers, congestion, vomiting and even treat leukemia! The red bud is one of the very few trees to produce flowers and fruit on the same branches. Unfortunately these fruits are a cuisine to many white tailed deer and livestock. Early settlers would take the fruit and add to their salads. They prefer full sun and partial shade so finding the right spot in your landscape with a decent amount of afternoon shade just might be the key to the survival of this beauty. No need to test your soil! The Red bud adapts pretty much wherever you place it. Loamy, clay, acidic, alkaline etc. soil are all favorites of this tree. Placing about 3 inches of organic composted mulches around the base of the tree, but without touching the trunk is extremely beneficial for the health of the tree and can help retain moisture in the soil to prevent over frequent watering. We offer 100% organic mulches in Stone Mountain, Ga. recycled from the trees we remove from our customers properties. Maintaining regular pruning by hiring a certified Arborist to formulate a plan for your tree to ensure the health of your Red bud. Having a certiifed Arborist in Stone Mountain check on your trees is completely free and beneficial to the health of the trees! Call us today for a free estimate on your property! Is It Safe To Top My Tree? Driving around Athens, its easy to spot the trees that power companies have hacked off to prevent them getting in the electrical wires. Even some, crepe myrtles being the most picked to prune back the top so heavily it looks as if it was just chopped completely. Topping a tree might be a quick fix but in reality it will eventually result in the trees death, depending on how much was removed. Tree topping leads to major stress for the tree in Athens, Ga. When you remove all the leaves, you are removing its nutrient source, leading to starvation of the tree, triggering random responses. The openings from the cuts leave the tree susceptible to pests and other diseases to come in and feed on the tree. At this point, the tree will be under such stress it will not be able to defend it self from such attacks. Topping might be a quick fix but will cost much more to maintain later on down the road due to increased pruning costs. The tree will also be very weak and unstable until it its fully healed. Depending on what lies beneath the tree, this can be a potential liability to you or the neighbors around you, if that tree was to fall. It is shown that well maintained lawn and landscape increases property value anywhere from 16-25%. By topping the tree and not taking the proper pruning measures needed to ensure the health of your trees, you are cutting down on your property value as well. The best thing to do is hire a certified Arborist to come out to your property and assess your trees health. We offer free estimates and routine maintenance plans for your landscape in Athens, Ga. It is important while shopping for estimates to keep in mind that having insurance and workers compensation is necessary for you to not be liable for any damages. A certified arborist will also be able to properly identify and diagnose trees with certain diseases or downfalls. Call us today for a free estimate on your trees! Are My Trees Causing Cracks In My Driveway? Have you noticed a large amount of driveway or sidewalk cracks popping up on your property in Monroe, Ga.? This could be caused by the roots of large trees growing underneath them causing them to crack. But concrete isn’t cheap to replace so how can you prevent this from happening without removing the tree altogether? Our first piece of advice of course will be to plan properly when planting trees not to plant them too close to any type of obstruction that could eventually cause issues including sidewalks, driveways, houses, etc. However there are a few different options if the tree has already started causing issues. Depending on what type of tree is causing the damage in Monroe, Ga., and what type of root system it carries underneath it, you might be able to kill the single root that is protruding through the concrete with Copper Sulphate. This is something that should only be performed by professionals, though, as this can damage the soil. Additionally, this only will work if there is a single root that needs to be removed. Root pruning will encourage the roots to grow closer to the trunk of the tree rather than out towards your driveway or sidewalk, involves no chemicals and no damage to the tree whatsoever. This is the most viable option in this situation in Monroe, Ga. However root pruning also, should not be performed by anyone other than a professional as removing too much of a tree’s root system could be potentially fatal to the tree. Once you have removed the root, by either pruning or the Sulphate option, it is important to make a trench or some sort of barrier inbetween the root and the concrete to prevent it from further damaging the concrete. Most home retail stores sell these sort of barriers for weeds at a low price with easy installation. It is important to bury the barrier a few inches into the soil, though, as the roots will grow deep and wide and will be difficult to locate until after a problem has risen. If you are in Monroe, Ga. and having roots issues with your trees, give us a call for a free estimate on removing the root ad fixing the damage! Controlling & Preventing Hickory Bark Beetles. What are hickory bark beetles? Hickory bark beetles are a very deadly pest that affect all kinds of Hickory trees in the Athens, Ga. They are about 1/5 inch long with a reddish/brown hue covering its back with few hairs. The difference in male and female bark beetles is the spine. The male will have four spines and the female carries no spines. What damages do they cause? 3mm holes in the bark indicating an entrance of pests. Engraved designs on the inside of the bark, once peeled back. Hickory bark beetles are known to carry diseases such as the dutch elm disease, which killed thousands of the american elm’s in the United States over the past few years. As they go from tree to tree, this disease is rapidly spread and very hard to manage and control once emerged. Another fungus associated with this beetle is called Ceratocystis smalleyi, which causes crown die-back and cankers. Hickory bark beetles are very deadly and once they have spread, usually the tree will have to be removed all together to be sure none of the other trees become infected as well. However, they are not likely to attack a very healthy tree so the best measure of control to do here is more of a preventative such as pruning regularly, fertilization, regular watering schedules, etc. If you have concerns about bark beetles on your property, be sure to contact your local certified Arborist in Athens, Ga. to confirm diagnosis and begin a treatment plan for the area right away before they spread to other trees. Questions or concerns? Contact an Arborist now! Why Is There Slime On My Tree? Have you noticed any kind of watery or slimy substance coming out of your trees in Lawrenceville, Ga? This is typically identified as bacterial wetwood or slime flux. The primary host for this type of bacteria are the most popular elm trees used in neighborhoods and business complexes. However, this disease has been known to affect a range of other species including hickory, birch, sycamore, cherry, ash, willow, maple, etc. There are a number of different reasons this disease could infect your once healthy trees in Lawrenceville, including simple environmental stress factors. It is primarily caused by a bacterial infection in the inner sapwood and the outer heartwood of the tree. Any type of wound or injury to the tree can cause an infection, as this opens the tree up for disease to enter. Improper planting is another cause, where soil compaction could be a potential issue due to heavy traffic around the tree. Making sure to prune back all dead or dying branches to prevent the tree from wasting energy. Make sure the soil around the base is good and has not become compacted. Water the tree on a regular schedule while it is under stress from the bacteria. Try home remedies such as dish soap & small amounts of alcohol to disinfect the tree and keep it clean. A lot of homeowners will notice the pests starting to get around the slime and think, “oh, better get some pesticides to treat the infestation”. We do not recommend doing this at all, as it can potentially damage the tree further. The best thing to do for the trees that have been infected is to keep them clean, and keep them maintained. Some homeowners swear by the dish soap method of cleaning the slim flux off the tree. Simply by using dish soap and water to clean the slime off every couple of days, it acts as a block to the bacteria. Most of the time, the healthy trees will be able to grow new wood around the diseased portion of the tree. Before you take any measures in Lawrenceville, make sure to consult with an Arborist first, to properly identify and diagnose the tree before moving forward with a treatment plan. Need A Consultation? Call Us Today! In Watkinsville, Aphids can be hard to identify at first because they are so extremely small and like to hide in places like the underside of a leaf. However, they do tend to multiply very fast and it is important to get them under control at the first sight. They are so tiny, they are almost impossible to see and can be a range of different colors including black, brown, green, etc. Aphids are not picky, in fact, they have many different species that feed on different types of plants such as the rose aphids or the green peach aphids. The first and most obvious identifier would be the large clusters of aphids on the leaves, stems or buds of the tree or plant. Aphids gather in large colonies in their attacks. Leaf wilt is another important sign. If your leaves are curling under or turning yellow, flip them over and check for any sign of aphids. Look for stickiness on the leaves, or sticky droppings falling from the trees, as this is a sign of honeydew & that the aphids have been eating the sap. If you have a flowering or a fruit producing tree or plant and notice any distortion to the flower or fruit, this could be another indication. Noticing any bumps on your trees? These are called “galls” and can be caused by Aphids. You can manually remove them by pinching them off, one by one. Cold water is unfavorable to the aphids, try blasting them, not too hard, but with very cold water. Neem oil is another organic way to rid your trees and plants of the aphids. This is most effective and most widely used on vergetable and fruit gardens. “Safer Soap” a natural pesticide is also very safe and effective to use in treatment. This will cause dehydration and death of the aphids within hours. We do not recommend using any type of harmful chemical pesticide unless the infestation is large enough for justification. Botanical insecticides can be bought at local home stores, just be sure to read all the label instructions before use. Over fertilizing your trees and plants can cause a rapid aphid infestation as the aphids enjoy plants and trees with high nitrogen levels and soft new growth. While neem oil is used as an all natural treatment for aphids, it is also an effective preventative measure to take before they take over. Insects such as lacewings, wasps, and lady beetles feed on aphids. You might want to consider placing these insects around or planting some species that they are attracted to near the aphid infestation and let nature take its course! Aphids can really damage your trees and plants, and sometimes can be harder to get rid of depending on the size of the infestation. It is important to know when a professional should step in and take care of the problem once and for all. Click the link below to get in touch with one of our Arborists in Watkinsville, Ga. for a free estimate! Tired of the bugs? Call us today for a free quote!